I wonder how many of us will be giving and receiving A.A. Milne’s wonderful stories about Christopher Robin, Winnie-the-Pooh and their many friends. These timeless characters are brought to life in our imaginations by E.H. Shepard’s captivating illustrations. 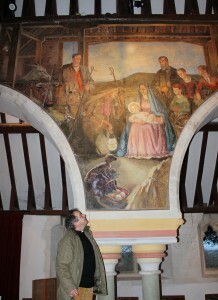 Both author and illustrator lived in Sussex. A.A. Milne purchased Cotchford Farm on the edge of Hartfield, East Sussex, in 1925. The surrounding Ashdown Forest would provide the inspiration for the Hundred Acre Wood where Christopher Robin and Winnie-the-Pooh’s adventures are set. Ernest Howard Shepard lived at Lodsworth near Petworth, West Sussex. 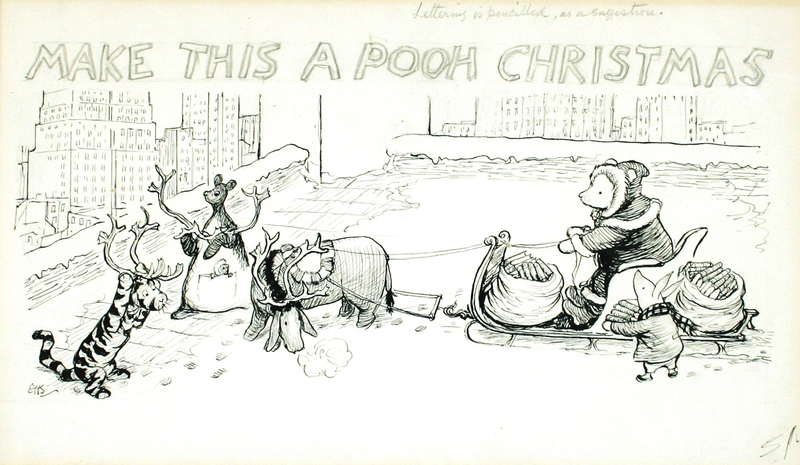 E.H. Shepard was born in St John’s Wood and by 1906 had become a successful illustrator. He served in the First World War and was awarded the Military Cross for his ‘conspicuous gallantry and devotion to duty’ at the Battle of Passchendaele. Milne had been uncertain that Shepard was the right illustrator for his stories. But after the success of ‘When We Were Very Young’ Milne acknowledged Shepard’s contribution by arranging for the illustrator to receive a share of the royalties. A.A. Milne’s son, Christopher Robin Milne, was born in 1920. Famously the inspiration for the characters in these stories came from Christopher Robin’s toys. However E.H. Shepard based his depiction of Winnie-the-Pooh on his son’s teddy bear called Growler. Winnie-The-Pooh was first introduced as Edward. The pencil and ink drawing by E.H. Shepard, illustrated here, remains one of my favourite objects ever auctioned at Toovey’s. Titled ‘Make This a Pooh Christmas’ this festive scene depicts Tigger, Eeyore, Kanga and Roo putting on antlers, whilst Winnie-the-Pooh sits in the sleigh dressed as Father Christmas. Piglet busily fills the sacks with books. Judging by the city skyline the friends have ventured beyond the borders of the Hundred Acre Wood. Perhaps unsurprisingly this wonderful sketch realised £16,000. Copies of these stories, even early editions, can be bought reasonably but what a difference a fine edition or a dust-jacket can make. 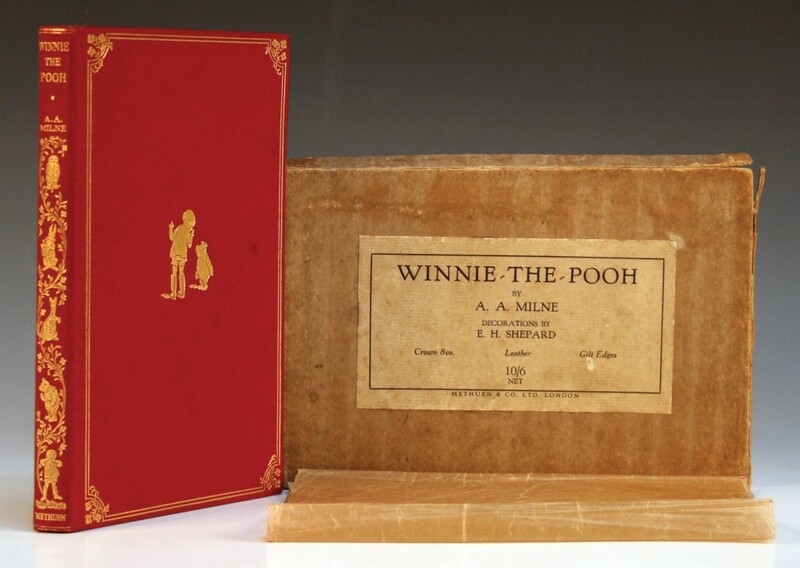 Take for example this 1926 first edition of ‘Winnie-the-Pooh’ in its original red morocco and gilt binding. It came in with its rare original glassine dust-jacket and publisher’s box and realised £900 in a Toovey’s specialist book auction. Published by Methuen & Co the four first editions shown here all had their paper dust-jackets. 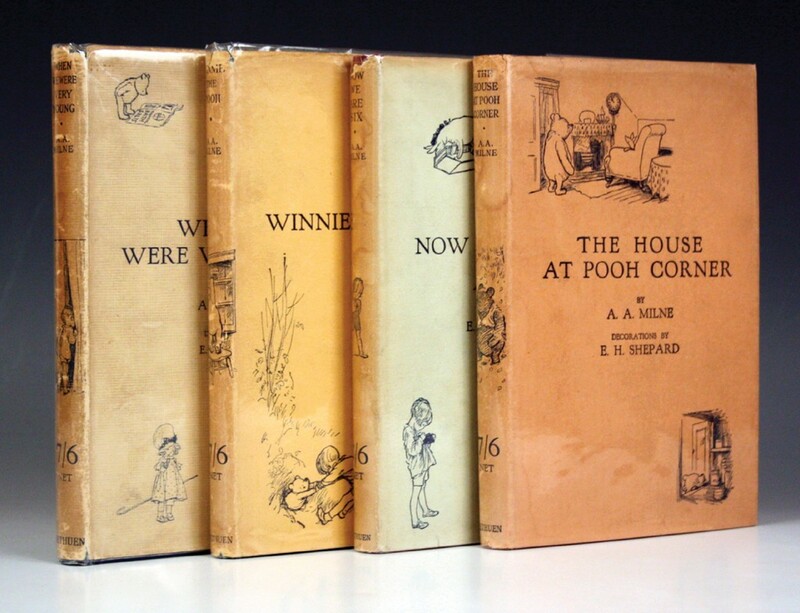 They included ‘When We Were Very Young’, 1924; ‘Winnie-the-Pooh’, 1926; ‘Now We Are Six’, 1927 and ‘The House at Pooh Corner’, 1928. Together they realised £2900 at Toovey’s. Who could not share Pooh’s delight in food when Christmas champagne, scrambled egg and smoked salmon are on the menu! Toovey’s next specialist sale of books is to be held on Tuesday 21st April 2015. A first edition of ‘House at Pooh Corner’ from 1928 with its original glassine dust-jacket and publisher’s box is one of the early entries! If you would like advice on selling or buying collectors’ books please feel free to contact Nicholas Toovey at Toovey’s on 01903 891955. Perhaps this Christmas you too should share the delights of that fine Sussex bear Winnie-The-Pooh. Whether it’s a new or a collector’s copy the stories, with E. H. Shepard’s illustrations, won’t fail to delight. Make yours a Winnie-The-Pooh Christmas! By Revd. Rupert Toovey. Originally published on 17th December 2014 in the West Sussex Gazette. 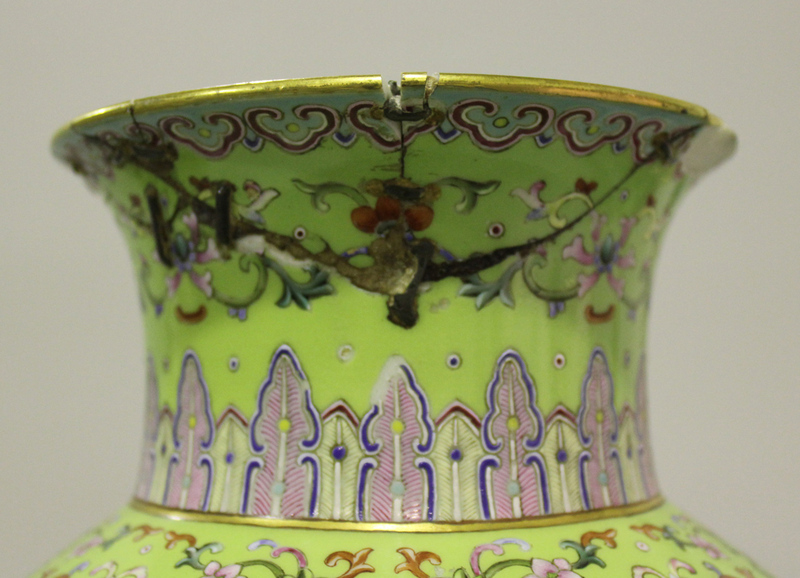 An insightful exhibition has just opened at the Ashmolean Museum, Oxford. It focuses on the life and work of the remarkable romantic, visionary artist and poet, William Blake (1757-1827). The exhibition ‘William Blake Apprentice and Master’ explores the artist’s formation as he became one of Britain’s most important poets, artists and printmakers. 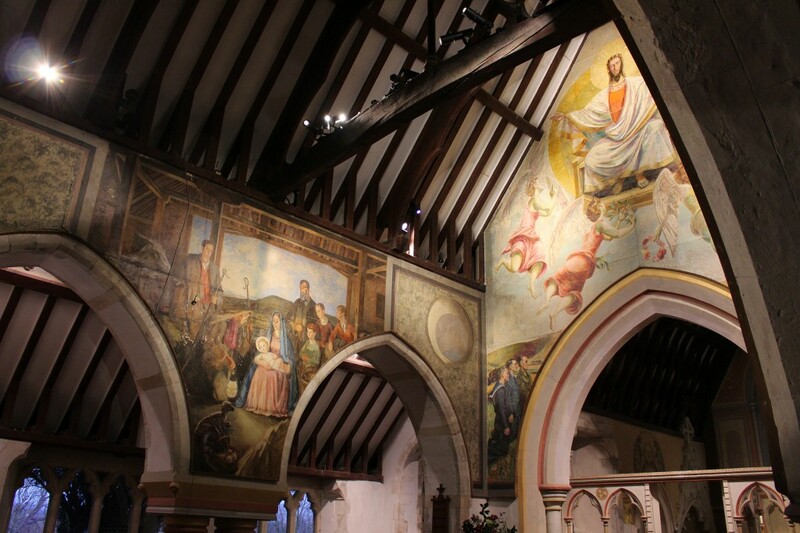 Although the importance of Blake’s work was not wholly understood during his own life-time it inspired a new, younger generation of visionary artists which included Samuel Palmer, George Richmond and Edward Calvert, who called themselves ‘the Ancients’. William Blake’s artistic promise was apparent at an early age and he was apprenticed to James Basire aged fifteen. Basire was the official engraver to the Society of Antiquaries and sent Blake to study Westminster Abbey and other gothic churches in London. In 1779 Blake joined the Antique School of the Royal Academy. These early experiences would inform William Blake’s unorthodox approach to the depiction of both the gothic and the human form. 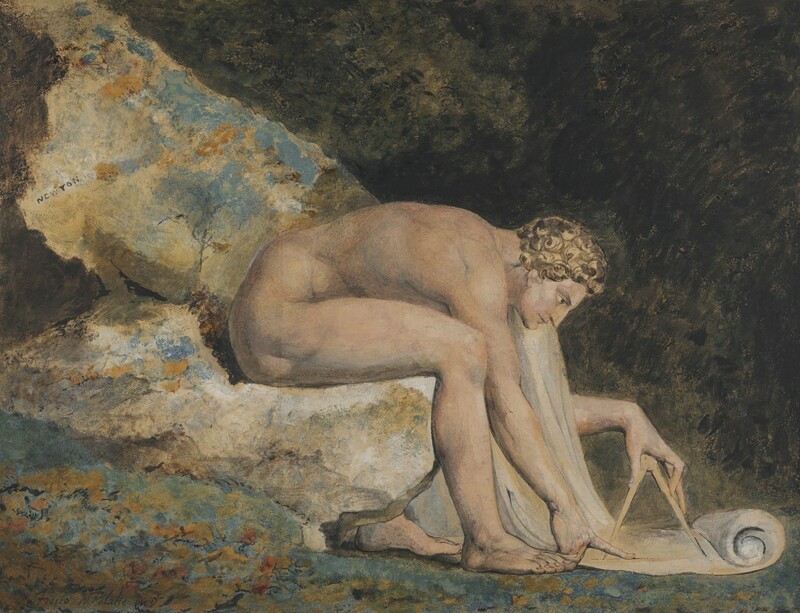 By 1789 Blake was at the height of his powers, producing work of extraordinary originality. 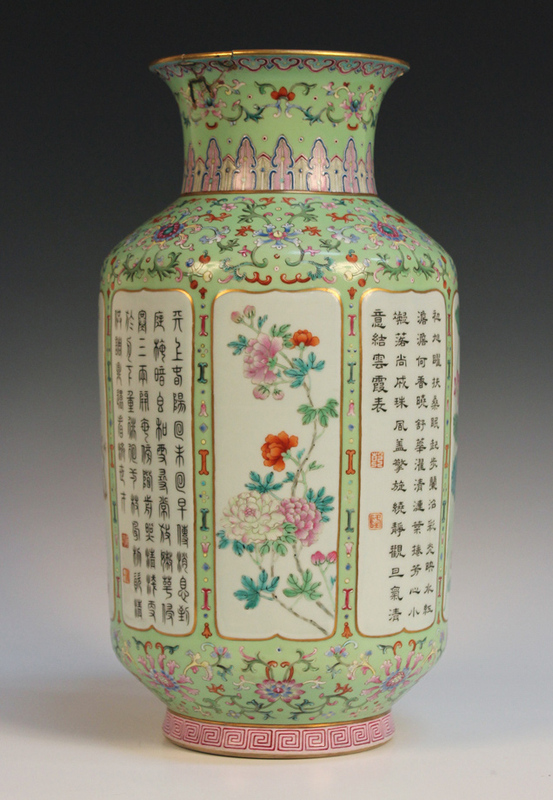 It was during this period that the artist began experimenting with new printing techniques including relief etching. His technical innovations included developments in colour printing, a method he referred to as ‘Illuminated Printing’. Examples in the exhibition include the book ‘Songs of Innocence and Experience’. Its theme reflects the common Romantic narrative of the human journey from protected childhood innocence, to the effects of engaging with the world, leading to adulthood. 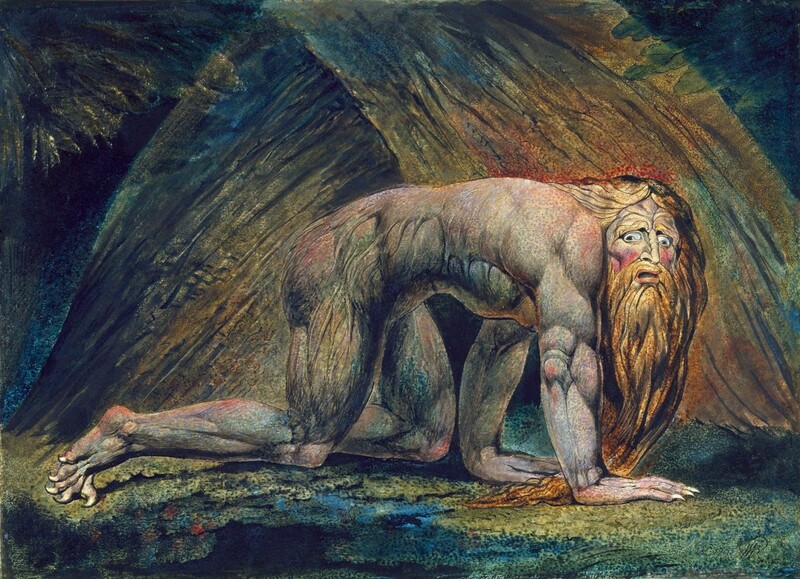 The large colour print ‘Nebuchadnezzar’ highlights Blake’s visionary and romantic reinterpretation of Biblical subjects. Here this ruler, described in the Old Testament Book of Daniel, is depicted as half-human, driven mad by his excessive pride and self-confidence. The large colour print ‘Newton’ is a favourite of mine. It depicts the famous scientist at work. It was reinterpreted by Sir Eduardo Paolozzi in the late 20th Century for his sculpture of the same title outside the British Library. Joseph Johnson published William Blake and many leading writers. These includied the early feminist Mary Wollstonecraft, the theologian and scientist Joseph Priestly, the artist John Henry Fuseli and the philosopher Richard Price. Blake became acquainted with these radical figures at Johnson’s gatherings. 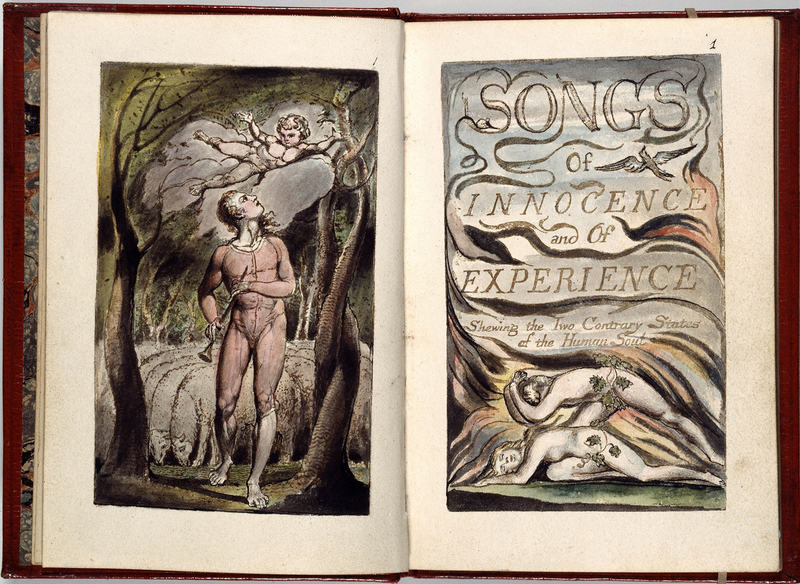 William Blake (1757–1827), Frontispiece and facing title page from ‘Songs of Innocence’, 1789, relief etching printed in brown ink with watercolour © Bodleian Library, University of Oxford. William Blake spent most of his life in London. However, for a number of years he lived in Sussex. In 1800 he moved to a cottage in Felpham, West Sussex, to illustrate work by the poet William Hayley. During this period William Blake wrote the poem titled ‘And Did Those Feet in Ancient Time’. It formed part of the preface to his epic work ‘Milton a Poet’. The title page is dated 1804 though Blake continued to work on it until 1808. As we near the end of 2014, the centenary year of the start of the First World War, it is poignant to reflect that in 1916 Robert Bridges, the Poet Laureate, edited a patriotic anthology of poems titled ‘The Spirit of Man’. Amongst these was the little known poem ‘And Did Those Feet in Ancient Time’ by William Blake, better known to us today as ‘Jerusalem’. In 1916 Bridges invited Hubert Parry to set ‘Jerusalem’ to music and it became a national anthem. In it Blake articulates the triumph of our green and pleasant land over the enslavement of our island’s peoples by the dark satanic mills of the industrial revolution. At the heart of this poem is a questioning of the myth that Jesus Christ visited these Isles with his Uncle, Joseph of Arimathea, a tin dealer. In Blake’s poem heaven and earth are to be united in a perfected creation. The New Jerusalem is to be built here in England. Blake uses this story from the Book of Revelations as a metaphor for social justice in his own times. The exhibition provides a very human insight into William Blake placing him in the context of his times and contemporaries. The recreation of his London studio, now lost, brings us an opportunity to connect with William Blake’s life and work in a particularly personal way. This fine exhibition provides a reminder of William Blake’s artistic talent and strong moral vision. 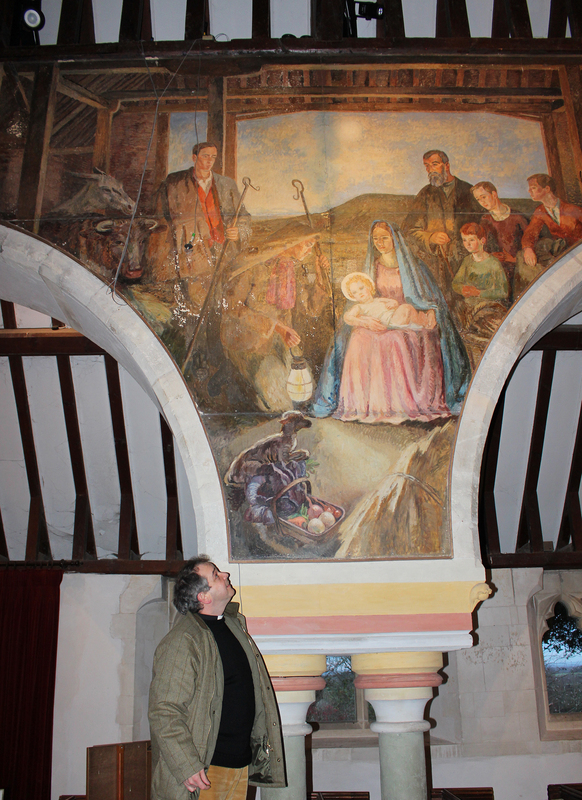 An important artist who has an important place in the story of Sussex as a leading centre for artists over the centuries. ‘William Blake: Apprentice & Master’, runs until 1st March 2015 at the Ashmolean Museum, Oxford. 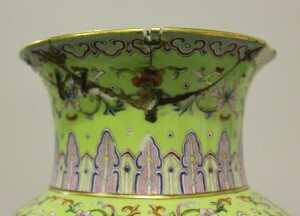 For further information go to www.ashmolean.org. The Blake Society are campaigning to buy his cottage at Felpham and preserve it for the nation, for more information go to www.blakesociety.org. By Revd. Rupert Toovey. Originally published on 10th December 2014 in the West Sussex Gazette. Toovey’s close for Christmas at 5pm on Thursday 18th December 2014.
and the sale day, New Year’s Eve, Wednesday 31st December from 9am to the start of the sale at 10am. Note: all sale enquiries will be responded to on our return. After the sale, we are closed from New Year’s Day, Thursday 1st January to Sunday 4th January. We return to our normal opening hours on Monday 5th January: Monday to Friday 10am to 3pm for valuations and 9am to 5pm for all other enquiries. We would like to wish all our customers a very Happy Christmas and look forward to welcoming you at our Spring Gardens rooms soon.